I have a lot more french manicure stuff to post, but it's putting me to sleep! So how about I spice things up a bit in between bland french mani posts? Your eyeballs can't repel sparkle of that magnitude! 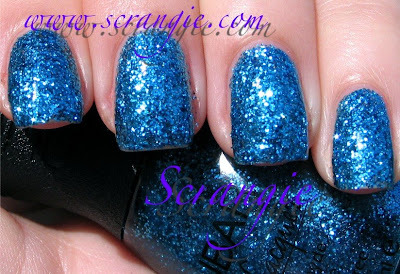 Disco Blue Glitter is a medium blue shade of fairly large size yet not chunky in texture glitter. It looks chunky, but it has a strangely smooth and flat feel for this type of glitter. 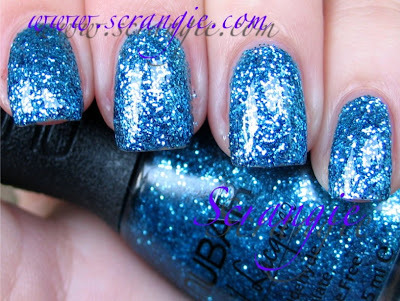 That's the beauty of Nubar's glitters, they're unusually smooth. The way the glitter lies on the nail is also fairly different from other glitters I own. It is really flat and smooth looking, the closest glitter I can compare it to is Milani Disco Lights. It's like little glitter platelets. Hard to describe, but the end result is spectacular. Nubar is known for their out-of-this-world unique and breathtakingly beautiful duochrome shades like Peacock Feathers and Purple Beach, but they also have some of the best glitters on the market. They're all intensely sparkly to the point of being dangerous in their ability to distract. If you walk outside wearing one of Nubar's glitters on your nails, I guarantee that you will be staring at your hands more than is probably safe. The other special feature of Nubar's glitters are the shades. Yes, they have the standard gold-silver-holo-red type glitters, but they also have colors that you'd be hard pressed to find anywhere else. Orange glitter is one of my favorites, but they also carry a burgundy glitter, which is a color I haven't seen from another brand (feel free to correct me if I'm wrong, I'm always looking for new glitters!). Grass Green glitter is the best green glitter in my collection. I'll be posting pictures of all of my favorites as soon as I can re-photograph them, but in this humble glitter addict's opinion, Nubar glitters are a glitter lover's dream. And, like I mentioned above, Nubar's glitters are strangely smooth. Normally wearing glitter is like having little sheets of sandpaper on your nails (which doesn't bother me but is sometimes a deal breaker for people) but the glitters I have from Nubar aren't half as rough. I don't know why that is. Maybe it's the type of glitter they use or maybe it's something in the formula. Either way, it cuts down on the amount of topcoat you have to use to produce a smooth, glassy finish. Really, what I'm trying to say is that Nubar glitters rock. I love them. I'm obsessed with glitter and I loooooove this shade of blue. I can't wait to see more Nubar glitters. This one's breath-taking... OMG I'm so amazed! I neeeeed this one! That is gorgeous! Wow. FAR more exciting than French! I just ordered my first Nubar today in fact - Peacock Feathers - as it looked so exciting in the bottle. Now I wish I'd paid closer attention to the glitters! Pretty...I need some distraction right now, and this is mighty distracting. It should have a warning on it, "Do not wear while driving. We are not responsible for crashes caused by the sun falling on your bling." I have gotten into glitters because of you Scrangie, so keep up the glitter posts. Much better than French manicures, which are nice, but boring. Not at all like you! I'm attracted to glittah like a moth to a flame. I need to check out Nubars glittah select-cion! stat!! Ouch; hurts my eyes :) Seriously, this is spectacular! What about the opacity of those? cor that is intensely sparkly, am in lurve! Ugh.... so gorgeous! I'm lemming a ton of Nubar shades, and I just don't know where to get them! Can i only order them online, or what? Are there any consistent retailers? :( I've been dying to get Pasadena Purple since I saw "He's Just Not That Into You". Legra, haha I know how it is! Glitter is the best! Alexlyndra, isn't it awesome?! Blinding!! Helen, agreed!! Peacock Feathers will rock your world, haha! Vanessa, lol! I should put up a warning :) Opacity is great, reasonable in two coats and perfect in three! Clockwork, it's so IN YOUR FACE too, you can't ignore this color when it's on your nails! Sybelle, haha they're all good, especially Green Silver, it's a mix of green and holo! Rachel, I get mine directly from Nubar (bynubar.com) but I think there's an eBay seller who ships internationally too... Anyone know which seller it is? Scrangie - How can I get the Party Like a Rockstar set by ordering on Lippmann? Is there a special code I need to use? Fauxfun, there doesn't seem to be a code included in the email- all it says is spend $50 and receive the kit for free, but I would mention it in the comments section just to be safe! ....im really about to freak out like a 4 year old child due to the fact that i cant take advantage of RBL's deal tomorrow :'( thats definately a ONE TIME deal. Wooh hoo, I love glitter! That is seriously beautiful. I have a few of their glitters. I must go visit them again. I just bought 13 BB polishes. I need me a sugar daddy or a polish daddy. Thank you Scrangie! I want to fulfill the all over bling even more than the dark glitter at the moment. So I just scooped Frugalista and Locavore! I can't wait! Lacquer Laine, Yay! You'll love them, they're so hot! That beign said, could you please enlighten us as to which one is better : Zoya Ki or Nuabr Purple Beach? They seem similar, though Ki seems a tad darker. Which one has a smoother formula? Which one is more "duochromy"? Which one lasts longer in temrs of chip and we4ar? Thank you very much. We look forward to your reply and other posts.